It's finally here. 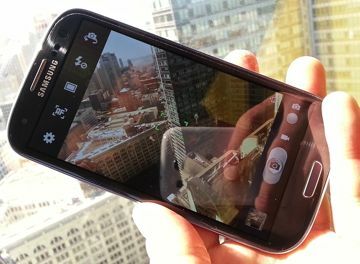 Samsung's 2012 hero device is the Galaxy S III. It's a shining example of the old adage "third time's the charm." The third iteration of Samsung's premiere smartphone nails almost every single feature. The Galaxy S III - Samsung's flagship smartphone for 2012 - hits U.S. shelves in the coming weeks. Now that Samsung is the world's largest maker of phones, the GS3 is one of the most important phones this year. In the hyper-competitive phone market, Samsung needs the GS3 to fend off devices such as HTC's One series, and Apple's iconic iPhone line. Can the Galaxy S III do that? The GS3 is so packed with features, even advanced users will have a hard time putting them all to use. If you want to carry one of the most advanced smartphones available, the Samsung Galaxy S III fits the bill. We've had our GSIII units on constant demo display since the launch, and we haven't had any issues. If they do, I haven't noticed it (must be a combination of super pixel density and my aging eyes, lol). You have been out of the loop. Specs arent everything, the US version actually outperformed the quad core. I have had the HTC Evo 4G (forget about the big deal 4G WiMax)...Never Ever could get it to work. Anyway, I am continually encountering a "low memory" warning and when I do I lose functionality most notably my email won't send or receive. When I go to my Application Manager I see that there I lose my capability at about 43MB (Free). I assumed this was a RAM measurement but it isn't. I have plenty of free RAM. So this is phone memory, but I don't know how to measure what I Have. Right now it says 371 MB used and 57 MB Free. This is a total of 428 MB Memory. What...???? I though I had gigabites of internal memory. Do you live in a 4G area? If so, have you updated PRL and Profile - along with actually making sure the WiMax radio is turned on? Download this app it will help you find out which apps can be stored on the sd card, freeing up memory for you. First, we need to break down the two types of memory. ROM vs RAM. Just like a computer, your phone is broken down these two types. Read Only Memory(ROM) is what programs and info are stored on regardless if being used or not. My bet, as far as voice quality is concerned on the AT&T vs. T-Mobile comparison, is that the reviewer was seeing limitations of AT&T's network rather than of the phone itself. You see, AT&T has for quite awhile chosen to use AMR-HR (Half Rate) as its vocoder, at least on its GSM network, and I wouldn't be surprised if that carried over onto HSPA. In contrast, T-Mobile uses AMR-FR. Double the bits means MUCH better audio quality on T-Mobile than AT&T. Because if this, my bet is that Sprint's GSIII will also sound better than AT&T's, on par with T-Mobile. Verizon's will be pretty close.